SO, now we're in the home stretch! We've determined that I can in fact make chocolate curls, which excites the pants off me (not literally. That would be awkward), so now I wanted to see what else I could do. 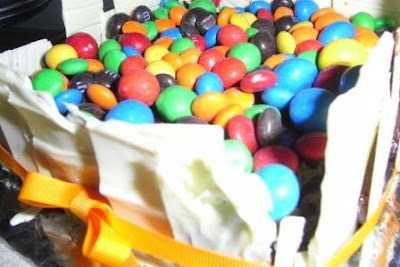 I decided that glueing white chocolate slabs around the sides of the cake and filling it with M&Ms would look pretty good and kind of different and funky. And I was right. 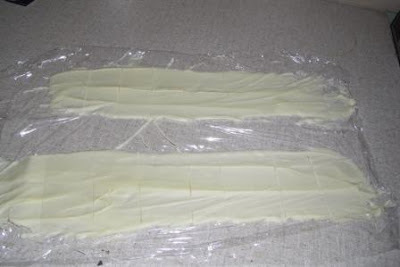 First up I melted the white chocolate in a double boiler, then I spread two rows of it on gladwrap and left it to dry on the bench. 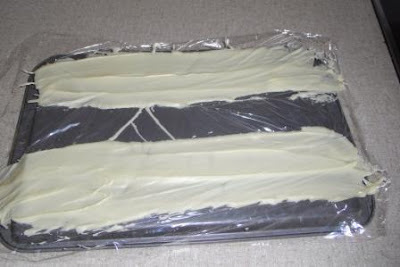 Next, I cut the chocolate into unevenly-sized slabs with my trusty metal paint scraper. 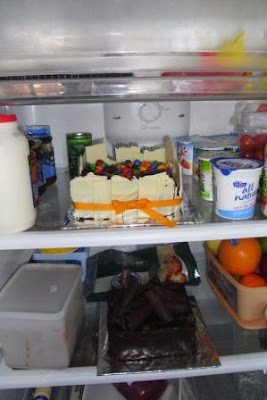 This worked well because I took the chocolate out of the freezer while it was still ever so slightly pliable. 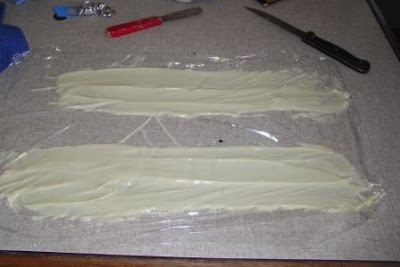 Once cut, I peeled the slabs off the gladwrap, popped them back on the cold tray and put them back in the freezer to finish setting. When it came to applying them, I cut some of the bigger ones in half across the middle to get two shorter pieces that could be turned on their sides, and also trimmed the bottoms so they'd sit flat. 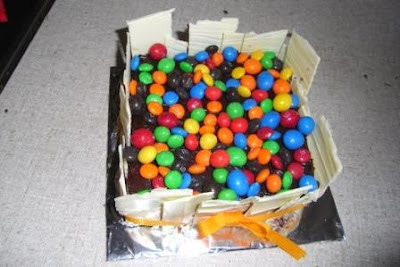 Then, I applied another layer of ganache to the cake (oh yeah. 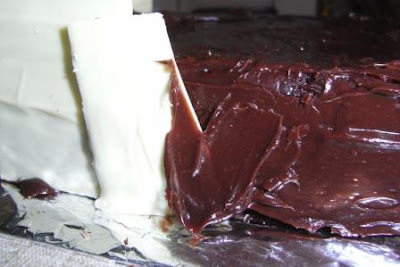 I did that for the previous cake too but I forgot to mention it, and now I CBF editing the post) and glued the white chocolate slabs onto the sides of the cake using more ganache. Finally, I tied a ribbon around the cake, which was a little challenging, so I ended up sticking a pin through the knot to hold it taught whilst I tied the bow, and then pulled the pin back out. So there you have it. I Really Am That Good. And I bet your fridge isn't filled with as much deliciousness as mine is, either. That looks awesome... and somehow I don't think it'll be as easy as you have described. And I can always fall back onto the excuse that I - like most normal people - have a gas cooktop, and may be terrified of catching fire whilst melting chocolate.